In order to maintain a perfect appearance to your landscaping, a well protected pavement is essential. Beautiful pavement will enhance your overall outdoor area and allow these areas to last a life time. Pavement does not need a great deal of maintenance if properly protected from the onslaught of the elements. Applying a good sealant will make the difference of a well maintained landscaping or not. By applying a good sealant to your pavers will preserve the brilliant colors of your pavement while increasing their lifetime. Concrete pavers that are manufactured with pigmentation allow your concrete to hold the various colors in place. These colors will not fade or change overtime and the material will not wear out and become eroded from wear and tear. Pavers need to be thoroughly cleaned and sealed to stop the buildup of dirt and prevent erosion. If you question weather your pavers should be sealed, the answer is yes! Without proper sealants, time and outdoor elements will take their toll on them. Applying a top coat will enrich the color and texture of your pavers while protecting them from harsh elements and high traffic. If you have spent the time and money for beautiful natural stone, you not only want to protect them but also maintain the natural colors in the veining and specks of the stone. You want to protect your pavers from all wear and tear and sealers will give you what you need. Proper sealers will help you maintain and protect your pavers year round. 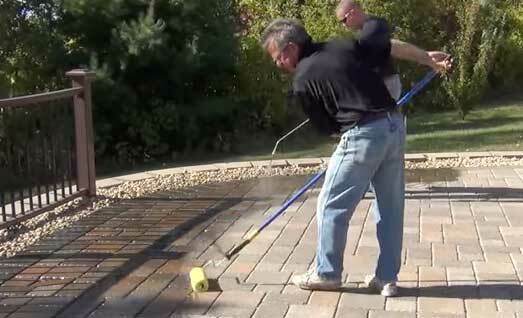 Applying a sealer to your pavers will help keep down the buildup of stains including oils, grease, etc. If well sealed, you will be able to remove these stains quite easily. The sealer will get in below the surface so all you have to do is wipe off stains and they are gone. If not protect, these stains will sink into your surfaces and become almost impossible to get out. Driveways are a big example of non-treated pavement that overtime can look terrible. This sealant will prevent staining, comes in a gloss formula, general sealer, colors protectors and high gloss. It's a good idea to inform your assistant where your pavers are applied to, i.e. the driveway, patio or pool area. This will help your supplier to advise you on the proper sealant to be used due to weather conditions and all aesthetic purposes. Before starting, make sure your surface is set and dry. You should not apply a sealant for 24 hours after the installation of your pavers. Clean all surfaces and remove any dirt and debris. If you have stubborn stains, get a good cleaning solution and follow all instructions. After installation is set, surfaces are cleaned, apply your sealer with a roller or large paint brush. This should depend on the size of the surface you are working with. Start in a corner and work out backwards. Let it dry completely before applying a second coat if applicable. It's highly recommended that you reapply a sealer every one to two years. Do not apply a coating sealer to pavers with a joint sand stabilizer such as “Sandlock” in the joints. It's also NOT RECOMMENED to use coating sealer on or anywhere near pool decks. Coating sealers can become very slippery when wet. In order to to maintain the appearance of your block paved surface applying a sealant is often necessary. A really beautiful pavement will give your outdoor area a polished and professional look. Pavers actually require very little care and will last a life time if looked after properly. It's essential that you apply a good sealant to the surface once your pavement is completed. By applying a sealant to your pavers will bring out the rich colors and patterns and add a beautiful shine to the surface. Once applied, it will be really easy to remove stains from high traffic areas. It will also keep down the buildup of dust that can be tracked into your home. 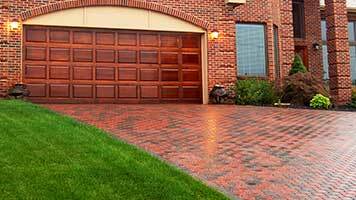 You want to maintain the beautiful colors of your pavement while curtailing wear and tear. When manufactured pigmentation are used on pavements, the concrete will hold the different colors in place. Unfortunately, over time, fading and erosion will appear from wear and high traffic. They need to be properly cleaned and sealed to prevent the buildup of dirt a erosion. UV resistance for the long haul. SRW Penetrating Paver Sealant offers a serious penetrating seal to pavers, concrete, masonry, cultured stone, brick, segmental retaining walls, granite and limestone while preventing moisture while stabilizing the joints in between the pavers themselves. This sealant can be used on brick, segmental retaining walls, pavers, concrete, masonry, cultured stone, bluestone, granite and limestone. It penetrates deeply into very hard surfaces in order to provide an excellent moisture protection. 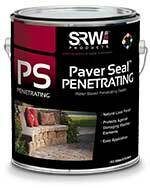 SRW Penetrating Paver Sealant may be used on both exterior and interior applications. Will reduce salt and frost damage that can cause future cracking. For long term effectiveness, this product offers an excellent UV resistance. SRW Penetrating Paver Sealant is extremely easy to use and is created to seal out moisture while increasing the life time and durability of masonry, concrete, stones and pavers. One of the leading problems with stone and masonry is when water seeps into the material and freezes, cracking and spalling will follow. This product removes these problems quite drastically while increasing the durability and life time of these materials. SRW Penetrating Paver Sealant will not alter the appearance or the texture of hard surfaces, instead it deeply penetrates to form a sealant. It can be easily applied by spraying or rolling the product onto the materials. It even protects sand and joints where ants and weeds have a tendency to intrude. This is an excellent choice for those who want their paving surface to have more of a matte finish. This sealant provides a low gloss on masonry, limestone, concrete, pavers, cultured stone and segmental retaining walls. It will stop moisture while stabilizing joints while keeping that natural look. 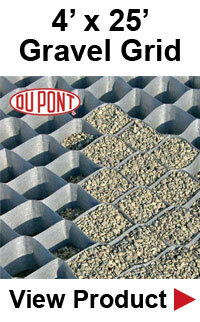 Can be used on pavers, masonry, concrete, segmental retaining walls, cultured stone and limestone. Will enhance stone color and attributes. May be used on interior and exterior materials. 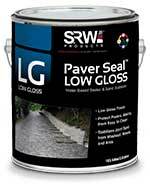 SRW Low Gloss Paver Sealant will minimize salt and frost damage and allowing for a long-term effectiveness by providing an excellent UV resistance. This product is very easy to apply while providing a low gloss protection that is excellent for masonry, stones, concrete and pavers while preventing water absorption. This product will prolong the life time of these materials by preventing the seepage of water that can cause serious damage by freezing and then causing cracking. Many purchasers choose this product because they do not want the color or attributes of their stone, concrete, masonry, etc., altered and but not give the appearance of being wet! SRW Low Gloss Paver Sealant is very easy to apply with a spray or a roller and will stabilize sand and joints to keep out weeds and ants. This sealant provides a nice high gloss finish to enhance the colors and attributes of decorative stones. It offers a high gloss appearance to concrete, segmental retaining walls, masonry, cultured stones and limestone. As with the other high end products, it will protect your materials from moisture that can harm joints. 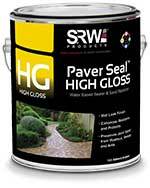 SRW High Gloss Paver Sealant provides a very professional sealed appearance. 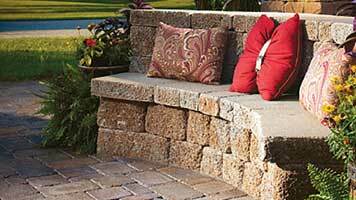 It can be used on segmental retaining walls, masonry, pavers, concrete cultured stones and limestone. Will enhance the colors and facets of these materials. Can be used on both exterior and interior materials. Minimizes salt and frost damage. It's really easy to apply with a spray or roller and will provide joint stability. It prevents the seepage of water that can freeze and cause serious cracking. This products will extend the lifespan of pavers, concrete, other masonry and stone by years. Whether you have spent your time and energy in a beautiful landscaping, an impressive walkway, an amazing courtyard or new patio extension to your home, you want to protect it for years to come. An excellent sealant will penetrate into your concrete, pavers, brick, granite or cultured stone and preventing years of unwanted deterioration. By sealing out moisture your surfaces will have durability and a much longer life time. SRW is a leader in sealants that will give you the very best protection and quality of any sealer on the market today. It is always considered a good idea to get with your local supplier guarantee you purchase the right sealant for the right hard surface. Follow all instructions when completing your initial installation and all steps for proper sealing and protection. With a little research, taking professional advise, your installations will last for a very long time and be well worth all your hard work.